NOTICE: Requires the base game Risen 2: Dark Waters in order to play. Activation key must be used on a valid Steam account, requires internet connection. 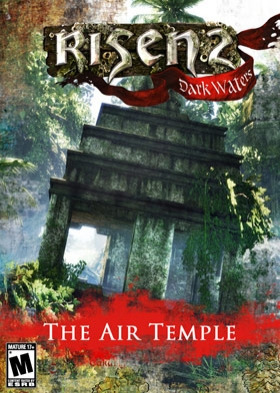 ABOUT THE GAMEUncover the mysteries of the Air Temple in this exclusive new adventure. Explore an additional island with new characters, quests and enemies.Gargoyles have infested the world of Risen 2: Dark Waters. Explore the mysterious Air Temp… le to uncover the mystery that surrounds it as you embark on an extensive new quest. Explore and discover an additional island with new characters, quests and enemies.SYSTEM REQUIREMENTS Minimum: OS: Windows XP (with Servicepack 2) Processor: Dual Core with 2.1 GHz Memory: 2 GB System RAM, 5,5 GB free HDD space Video Card: 512 MB Radeon 3870 / GeForce 8800 GTX DirectX: DirectX 9.1c Sound: DirectX compatible soundcard. Keyboard/mouse or gamepad required Internet Connection required for online activation.Recommended: OS: Windows XP (with Servicepack 3), Windows Vista (with Servicepack 1), Windows 7 Processor: Dual Core with 3 GHz Memory: 4 GB System RAM, 5,5 GB free HDD space Video Card: 1024 MB Radeon 4890 / GeForce GTX 260 DirectX: DirectX 9.1c Sound: DirectX compatible soundcard. Keyboard/mouse or gamepad required Internet Connection required for online activation.